The RE·PC Seattle retail store has been open since 1994 and is located just South of Safeco field in downtown Seattle. Since opening the doors nearly sixteen years ago, we have been active recyclers of computer technology in the realm of re-use and resale as well as tearing down to separate circuit boards, sheet metal or other material. RE·PC buys, sells, repairs, and accepts for recycling a wide selection of computers, monitors, printers, parts, cables, software, accessories and peripherals. There's also our famous "AS-IS" section where you'll find almost anything related to computers and electronics. Stop by our free Computer Museum and stroll down random access memory lane! Our Southcenter (Tukwila) store opened in early 1998 and has continued the practice of reuse and recycling that was made popular by our Seattle store. At almost double the warehouse space of our Seattle location, RE·PC Southcenter has the same great variety of computers, parts, peripherals and miscellaneous with more space for racks, networking, misc software and other unusual stuff. Located just south of Southcenter, our Tukwila location also takes in a wide variety of computer and electronics related recycling. We buy, sell, recycle and repair at this location as well. Please note that the Southcenter store does NOT have a computer museum like the Seattle store does; it does, however, sell a lot of vintage computer equipment and accessories in the store as well as online. Also, The Ink Stop, a company independent of RE·PC, is located inside RE·PC in Tukwila. The Ink Stop refills inkjet cartridges and also offers a full line of laserjet toners, remanufactured and compatible inkjet cartridges. They also supply remanufactured and prefilled ink-jet cartridges at our Seattle location. For more information about The Ink Stop, please see their website at www.theinkstopwa.com/. The Ink Stop can be reached at (206) 439-8500. Please note that RE·PC and The Ink Stop are two different companies, so please direct your questions accordingly. © 2009 REPC, All Rights Reserved. 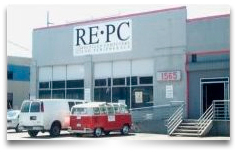 RE-PC's Tukwila location is moving to 600 Andover Park East this fall. Just 1 block East (next to Moe's Furniture).